WASHINGTON, DC/PARIS – From truck drivers using GPS systems to nurses recording patients’ vital signs to train conductors checking tickets with hand-held devices, everybody nowadays needs some basic digital skills. Demand for digitally savvy workers has been rising quietly over the last decade or more, but that shift is now gathering pace, and it is transforming the entire labor market, not just the tech sector. In a recent report, the McKinsey Global Institute compares the number of hours workers currently spend using 25 core skills in five categories – physical and manual, basic cognitive, higher cognitive, social and emotional, and technological – to the number of hours they will spend on those skills in 2030. Unsurprisingly, given the wider use of automation and artificial intelligence, we expect a 55% jump in demand for all types of technological skills, from basic digital knowledge to advanced skills like programming. Demand for social and emotional skills that machines lack – such as the ability to work in teams, to lead others, to negotiate, and to empathize – will also rise sharply. The number of jobs requiring such skills – in sectors like health care, education, sales and marketing, and management – will increase by 24%. Demand for some higher cognitive skills, especially creativity and complex problem-solving, will also rise. But machines are already making inroads into some areas that require higher cognitive skills such as advanced literacy and writing, and quantitative and statistical capabilities. This highlights the potential for automation and AI to displace even white-collar office workers, for example, in accounting, finance, and legal services. Still, it is jobs requiring basic cognitive skills, including data entry, that face the biggest challenge, as they are set to decline even faster than they have over the last 15 years. The same is true of physical and manual skills, such as gross motor skills. 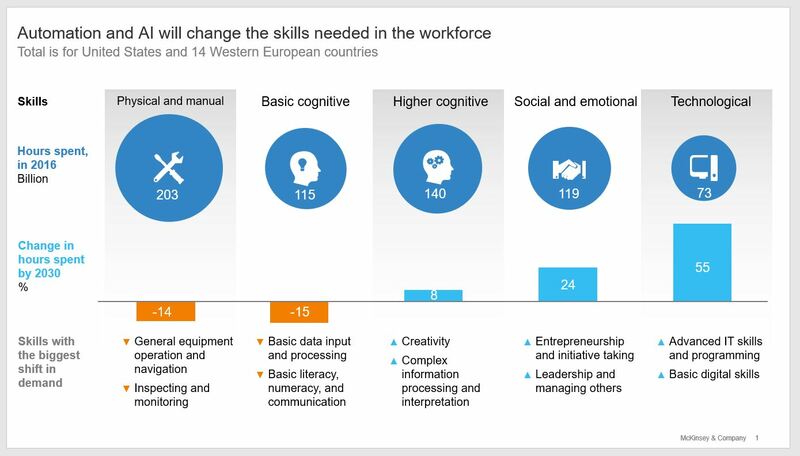 Though this may remain the largest skill category by hours worked in many countries, including the United States, in others, such as France and the United Kingdom, they will be overtaken by demand for social and emotional skills; in Germany, physical and manual skills will be surpassed by higher cognitive skills in terms of hours worked. Businesses, policymakers, educators, industry associations, and labor unions need to take note of these looming skill shifts, which represent a major socioeconomic challenge. For example, because social and emotional skills are currently learned largely outside of school, education systems may need to find ways to incorporate them into curricula. Moreover, hundreds of millions of workers around the world will need access to retraining initiatives, which today are relatively rare. We estimate that 75-375 million people, or 3-14% of the global workforce, will need to switch occupational categories by 2030 or become unemployed. If not managed well, such transitions could exacerbate social tensions and lead to rising skill and wage polarization. For companies, these skills shifts are part of the larger challenge posed by automation, which is disrupting business models and upending how work is organized within firms. In a survey of more than 3,000 business leaders that we conducted as part of our research, we found that companies expect to move toward cross-functional and team-based work, with an emphasis on agility. The challenge will be to secure workers with the right skills for companies’ particular technological needs and ambitions. Moreover, this is not a one-time shift. 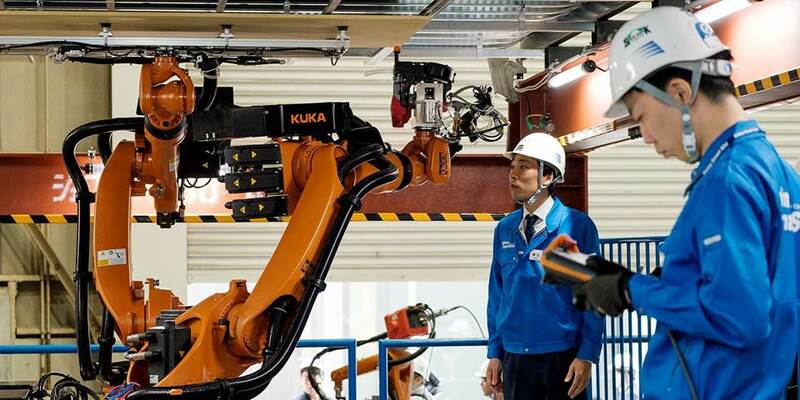 As the machines working alongside humans continue to evolve, workers will to need adapt. Instead of studying for two decades and working for the next four, as we have done in the past, workers will need continuous learning to acquire new skills and upgrade existing ones throughout our working lives. To realize that imperative requires not only concrete lifelong learning options, but also a change in workers’ mindsets and organizational cultures. To this end, some companies – for example, the German software provider SAP – are seeking to provide continuing education programs in-house. Others, such as AT&T, are working with educational institutions to raise workforce skills. In Sweden, job-security councils funded by companies and unions coach individuals who become unemployed and provide retraining and temporary financial support. In the US, the Markle Foundation’s pilot program Skillful helps workers without college degrees upgrade and market their skills. But much more needs to be done to ensure that companies and workers thrive in this new era of automation and AI. Only with an appropriately trained and adaptable workforce will our economies be able to secure the full productivity-enhancing benefits of evolving technologies. Eric Hazan is a managing partner at McKinsey & Company and a member of the McKinsey Global Institute Council.